1	 Influence of enzymatic medium components on tryptophan biosynthesis Shulga S. M., Tkachenko A. F., Tigunova O. O., Beyko N. E. Khomenko A. I. 2	 Biotechnological aspects of poly-?-hydroxybutyrate biosynthesis Vasylchenko O. A., Yastremskaya L. S., Salata A. M., Salata O. S., Fedun N. O. 3	 Development of amperometric microbiosensor for D-serin determination Soldatkin O. O. 5	 Influence of enzymatic medium components on tryptophan biosynthesis Shulga S. M., Tkachenko A. F., Tigunova O. O., Beyko N. E. Khomenko A. I. 6	 Characteristics of growth and elastase production by mutant of Bacillus sp. 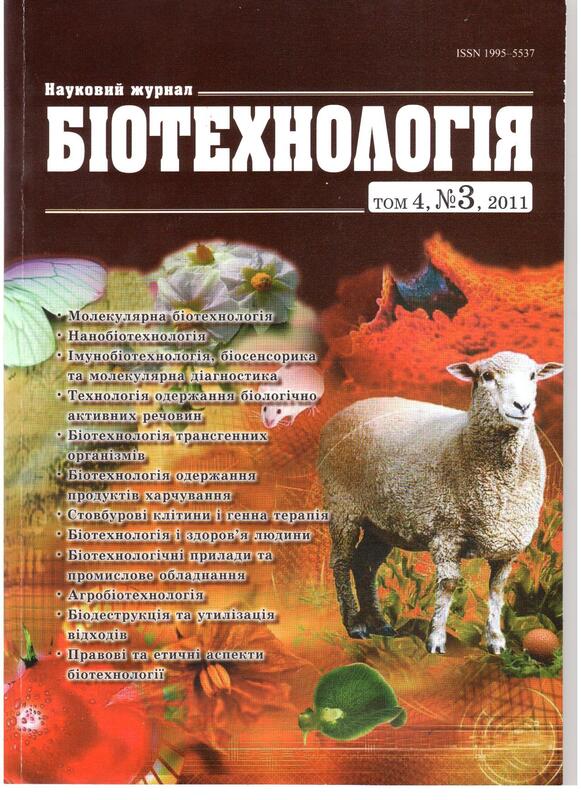 27-88ELS+ Matselyukh O. V., Nidialkova N. A., Varbanets L. D.
7	 Inulin synthesis in chihory hairy roots transformed with Agrobacterium rhizogenes Matvieieva N. A., Kishchenko O. M., Shakhovsky A. M., Kuchuk M. V.
10	 Obtaining and characterization of isolated root culture from plants of genus Gentiana Konvalyuk I. I., Hrytsak L. R., Mel’nyk V. M., Drobyk N. M., Kunakh V. A.